To continue the ride, take the track diverging on the left immediately after the golf centre. Follow this track across the golf course. Just before the end of the golf course, there is an informal café on the right. Go straight ahead along a quiet road (Beggars' Bottom). At the end, you come to a junction with Clay Hill. On the other side of the road to the left is the corner of Hillyfields Park. The ride continues to the right, however, along Clay Hill. 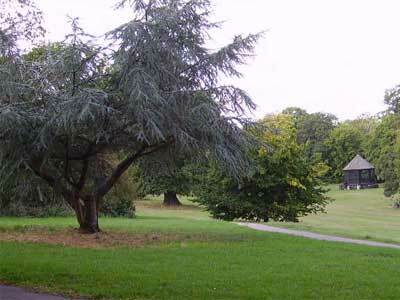 Enfield Urban District Council purchased 62 acres of farmland owned by Archdeacon Potter and opened Hilly Fields as a public park in 1911. This was part of their policy of acquiring land for public open space as the area was being developed for housing. A bandstand was provided to the east of the park in 1921 and was a popular attraction. On August Bank Holiday in 1927 it attracted an audience of nearly 5,000, but it later became derelict. The Friends of Hillyfields were set up in 1998 with the aim of restoring the bandstand, raising funding from the Heritage Lottery Fund and restoration was competed in 2001. Hillyfields has been described as ‘one of the most interesting grassland areas in the borough’ and the Council continues to strive to maintain its diversity. There are many mature trees, including large old pollarded trees and numerous oaks scattered over rough grassland.